In today’s “View from the Philly Pressbox” we look at the Penguins, 10-3, blowout of the Flyers in Game 4 of the 1st Round series. The Flyers now lead the series 3-1 as the series goes back to Penguins on Friday night. In our series preview we identified the four keys for the Flyers to win the series and they haven’t changed. Don’t fall behind early in games. The Flyers came out of the locker room and actually took a 1st period lead in a game for the first time in the series when Claude Giroux scored a power play goal just 1:16 seconds in to the game. Unfortunately it didn’t last long, 2:21 seconds to be exact, when the Flyers collapse began. Following the Evgeni Malkin goal, Matt Niskanen scored on the power play, another Zac Rinaldo penalty, 4:28 seconds later. The Penguins followed with a meltdown of their own, being called for three minor penalties in the span of 50 seconds. The Flyers capitalized by scoring two power play goals, one by Kimmo Timonen and one by Jakub Voracek.. The Flyers looked like they had regrouped. Again, it didn’t last long, the Penguins scored two goals in the final 3:41 of the period. The score after the period was 4-3 Pens. Although the Flyers did actually have the lead for the first time at the start of the game, they never had control of the period. They didn’t come out of the locker room with any intensity and paid the price for it. The disturbing thing about Game 4 is not that the Flyers couldn’t hold the lead in the 1st period but rather their failure to compete in the game. We’ve stated throughout the series that falling behind early is a problem. We continue to feel that way. The Flyers are still in control of the series; however, this area still needs to be corrected. Ilya Bryzgalov – Bryzgalov was awful!! Sergei Bobrovsky was equally bad!! Both goalies faced 18 shots and both gave up 5 goals. Pitiful! With that said, there’s equal blame to go around for the entire team and not just the defense. The Flyers were outworked throughout the game. They gave up four power play goals in nine chances. They likely wouldn’t have won this game if either of these goalies had played really well due to their lack of effort. Just as you win with a total team effort you can’t expect goalies to win games alone. It was a total team breakdown on both ends of the ice. Coach Peter Laviolette has his hands full in pulling the team back together and regaining the focus they’ve had up to this point. With that said. the goaltenders are required to make some saves to help the team win, in Game 4 that didn’t happen. Although 10 goals allowed balloons the statistics, the Flyers have now allowed 22 goals in 4 games and that’s not good enough!! Stay Healthy – As we stated previously the Flyers are close to adding James Van Riemsdyk back to the lineup and it can’t happen soon enough. Zac Rinaldo has got to be taken out of this series. Rinaldo is not capable of being on the ice without getting a penalty. He had 20 minutes in Game 3 and added another 26 minutes in Game 4 with only 3:39 seconds of ice time. The only possible injury in the game was to Nick Grossman, who took a shot to the head. Grossman is day-to-day at this point. Big Nick will be missed if he can’t play Friday night. Staying out of the penalty box will be critical. The penalty box situation in this game was a joke. Sunday’s game was a blood bath full of cheap shots. Games 1 and 2 were action packed, hard hitting games that were physical and fun to watch. The referees took that out of Game 4 by calling the game so close that the players couldn’t play. There were a total of 26 penalties in the game, 20 of them were minor penalties with 12 going against the Flyers. That’s’ more than a full period of the game shorthanded due to “ticky tack” penalties. The Flyers also received 3-10 minute misconduct penalties and a game misconduct. The Penguins received 2-10 minute misconducts. With all of these penalties there were not even any fighting penalties. Frankly, without sounding like we’re having a bad case of “sour grapes,” this game was a joke by the referees. It appears to us that the league instructed the referees to call the game so close that it took the game away. All of the power plays, 9, played in to the Penguins hands by creating opportunity after opportunity throughout the game. There was a stretch in the 2nd period where the Flyers were called for five minor penalties in a row, the last one going along with a Penguins penalty. During that time the Pens scored three power play goals and blew the game open by taking a 4-3 game and making it a 7-3 game. As stated in Game 3 when the Flyers scored five special teams goals they would win, well the same holds true that when you allow four power play goals you are most likely going to lose. Special Teams remain critical to the playoffs, and obviously the Game 4 advantage was to Pittsburgh after Games 1. 2 and 3 had gone to the Flyers. Let’s face the facts here, it was not in the best interest of the NHL to have the Stanley Cup favorites, playing shorthanded due to league suspensions, eliminated early in the playoffs by being swept. The Flyers didn’t play well but had no chance of winning this game any way. Again, we’ll show the same quote we showed in our series preview and after each of the first three games. We stated that “for the Flyers to win they need to get contributions from all of their lines. Obviously, the Claude Giroux, Scott Hartnell, Jaromir Jagr line needs to be good. Danny Briere needs to step up as he has in past playoffs. Wayne Simmons, Max Talbot and Jakub Voracek will need to contribute as they have all season. Just as important will be the play of the Flyers rookies, Matt Read, Sean Couturier and Brayden Schenn. 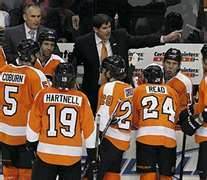 These rookies have played very well throughout the regular season; however, they need to lift their game to the next level that is playoff hockey!” In Game 4, no one showed up for the Flyers. Giroux did have a goal and an assist in the game. He also had a penalty and a -1 for the game. Danny Briere and Brayden Shenn were -4, Pavel Kubina, Wayne Simmonds and Matt Carle were all -3. Carle was called for two minor penalties while Simmonds and Kubina both had minor penalties and misconduct penalties. Overall it was a bad game for everyone wearing orange and black and in black and white striped shirts. The Flyers need to put this one behind them and come back Friday night ready to play. Our prediction had been the Flyers in 6 games. We felt a sweep in the series was too much to ask. We stated after Game 2 the Penguins “could come out with their elimination backs against the wall, play well, and win, or they could quit on the season and get ready for golfing”. What we saw in Game 4 from the Penguins is what we expected to see from them in Game 3 before they decided to “goon up” the game. The Penguins are a good hockey club and they showed it in Game 4. We changed our prediction from Flyers in 6 to Flyers in a sweep like everyone else that got caught in the emotion when we knew a sweep was very unlikely. We’re going to go back to Flyers is 6 games. The Flyers need to play well in Game 5 in Pittsburgh. Of course, we want them to win; however, what we need to do is play good, tough, discipline hockey as they have done in the first three games and there’s a good chance they could close out the series. The Flyers are still in command of the series and will win.